Ok, its not the drink Pina Colada that I’m going to blog about. However, the name Pina Colada makes one think of sunny sandy beaches, blue seas and lazing on the sunbed with a Pina Colada to keep you cool. The #FoodieMonday #Bloghop group decided on #Coconutmilk as the #86th theme. I was happy as I could just think of pina colada muffins (which has been on my ‘to do’ list for ages). However, hubby dear dashed all my hopes of baking muffins as he just said pretty adamantly ‘no baking muffins in this house, there’s been too many muffins.’ Truthfully, haven’t blogged a new muffin recipe in a long time, but how do I explain to hubby dear that the ones I baked last week were for friends and neighbours as they had requested for them. Anyway,will bake them pretty soon. So, now had to think of a healthy way to use coconut milk. I’ve already blogged quite a few Kenyan coastal dishes using coconut milk so what else, what else kept on revolving in my head. There is still no respite from the hot, hot weather here, we’re suppose to have rains! Having a hot bowl of oats in the morning is not so appealing and am getting bored of daily smoothies with oats in them. That’s when I thought of the overnight oats that my daughter had prepared for me when I was in Bangalore with her last year. She made overnight oats and added the seeds and nuts the next day and breakfast was ready. I kept on staring at my portion and kept on thinking these oats are going to be gooey and I hate gooey oats. Nami said ‘mum go on just try it, one spoon, if you don’t like them then I’ll prepare something else for you.’ Put one spoon in my mouth and it was not gooey at all and tasted chilled, creamy and delicious. That’s when I thought, ok its going to be a healthy dish, pina colada overnight oats.Before you check out the recipe for the Pina Colada Overnight Oats, here are a few tips on preparing overnight oats. Base: of course oats. Many recommend steel cut oats, but they tend to remaining a bit hard. Some say no to quick oats. What I say is use any type you like. I used quick cooking oats and the end result was a nice creamy consistency with a little bite. Liquid: Add any liquid you prefer right from normal milk, soya milk, nut milk, coconut milk to juices. Basically, the liquid should cover the oats. Add protein: can be plain of flavoured yogurt, greek yogurt (makes the oats more creamier), peanut butter or any other nut butter. Add the crunch: Add nuts like almonds, hazelnuts, cashew nuts, pistachios. Add seeds like pumpkin, sunflower, hemp seeds or flax seeds, chia seeds. Whatever you prefer. Add fruit: Can be fresh, canned or dried or a mixture of any. Berries, cherries, banana, mango, apple, peaches, grapes, dates, coconut…whatever you have at hand. Sweetener: From sugar, brown sugar, honey, maple syrup, agave nectar to stevia and jams. Your choice. Finally Spice it up: cinnamon, cardamom, chai masala, ginger powder, gingerbread spice, pumpkin bread spice, or extracts like vanilla, orange, or just a bit of coffee. And finally you need some empty jars — jam/jelly jars, pickle jars, olive jars … any jars with a lid. Ok, if you really insist you can go ahead and buy some of those fancy mason jars. The basic idea is to soak the oats overnight or for at least 4-6 hours. You can add the spices, sweetener, nuts, seeds and fruits. Or you can add the nuts, seeds and fruits in the morning. a) You can have a chilled breakfast during the hot season and fill full at the same time. b) Can carry your jar of goodness and have breakfast at work, No greasy canteen food. c) Because you prepare it the previous night, no rushing around in the morning to get breakfast ready. e) Aids in weight control or even to lose weight as overnight oats are filled with healthy nutrients. f) The one I like the best– who said overnight oats can be consumed only at breakfast? Think of it as a healthy option to curb your sweet tooth. Add a few dark chocolate chips and you’ve taken care of the craving. My Pina Colada recipe is a guideline to making your own variety of overnight oats.And before you ask… no I did not add a dash of rum ! Can’t start that early in the morning, can I? My recipe is for one serving only as hubby dear being a creature of habits, didn’t want to deviate from his normal bowl of hot oatmeal with fruits and nuts. Add oats in a jar. Add the chia seeds, vanilla extract and maple syrup. Mix well. Put the lid on the jar. Put the jar in the fridge. Next day add the chopped or crushed pineapple. Top it up with shredded coconut and almond pistachio slivers. I added the pineapple next day as I didn’t want the fruit to make the milk taste sour. Adding nuts the next day adds a bit of crunch, but you can add them at night too. Here I used fresh home made coconut milk. You can use canned one. To make fresh coconut milk at home, grate the coconut finely. Put the grated coconut in a blender jug. Add enough water to just about cover the coconut. Process it for 30-50 seconds. Strain the liquid using a fine meshed sieve or cheesecloth. Squeeze out all the liquid from the coconut mixture. This is your first creamy milk. Put the grated coconut bake into the blender jug. Add some water. Process and strain. This is the thin coconut milk. I used the first thick milk for the oats. The second or thin milk can be used to prepare a curry, rice or even in soups. Don’t throw away the grated coconut after processing it twice. Dry it at 100°C in the oven. When it is cool process it to make coconut flour. If the soaked oats are too thick, add more milk if you prefer. If you are using yogurt, reduce the amount of milk you use. Remember chia seeds absorb a lot of liquid. For me ¼ cup oats was more than enough as I added more fruit. You can take how much oats you prefer. I love oats n it's a 2 breakfasts in a week with variations….but never tried overnight oats as i only use quick oats … but this time I will try my hand in overnight oats….i loved pins colada version. 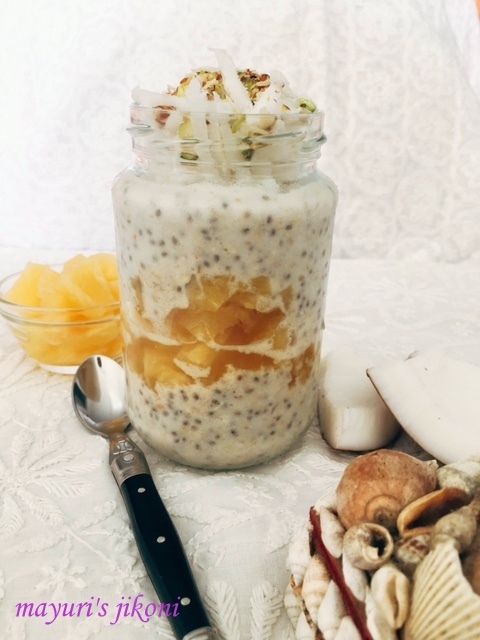 Loved the tropical way of overnight oats MayuriDi. Indeed a Pina Colada treat! Loved it Mayuri. I usually make overnight oats with yogurt. But now I will try your version. Healthy and tasty. Nisa I too use quick oats… I just soaked that in coconut milk and left in the fridge at night. Next day it was not gooey at all. Thanks Alka, I tried the pina colada version for the first time and loved it. Thanks Pushpita.. great summer treat. If you like you can half yogurt and half coconut milk Sujata. Thanks Rafeeda, now trying to pay more attention to my photos, and as my daughter says think think and look before you shoot. Trying to follow her advise 🙂 I don't think I've seen a post from you on pina colada oats or would have remembered. Wow never tried overnight oats,is in my to do list …love the way you have given a step by step explanation. Love the interesting twist to healthy overnight oats. A perfect breakfast idea for kids and even for me:) love the combination. Thank you Vidhya. It definitely saves time in the mornings. Saswati try them out, I too didn't know what I missed till my daughter made them.Now i make them often with different fruits and nuts seeds.